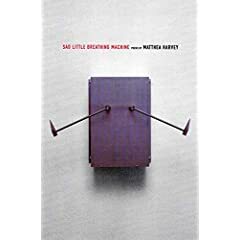 “Sad Little Breathing Machine.” Alone, the title is perfect, everything a poet’s creation should be: concise, dense, powerful. At once self-explanatory and self-exemplifying, Harvey does not fail to proliferate the repetition of these traits, with great mastery, throughout this book. Each poem does Coleridge’s definition of poetry – the best words in the best order – great justice. Hers are poems to sit down with and chew for flavour, food for thought with no other intention than allowing your saliva to mix with the subtle and tasty ingredients with which Harvey has so painstakingly concocted so many a perfect piece. The nature of this poetry is one that limits its own accessibility. By being composed in such a manner, each word demands deliberation concerning its partners: neighbors and sentence. This is not done with pretentious “I’m a poet, look at my art of confusion” intent, but rather as a call for readers to slow down and ponder meanings. Life is naught but a collection of moments, and seeing through a different lens – say, a poem – lends easily to misinterpretation if time is not spent trying to understand. A lot of the poems reflect this theme, missed opportunities much like the mental acknowledgment of a non-sequitur conversation while being engaged in one. I’ll admit a lot of these poems seem inaccessible, and, to some, more or less of them will be. Luckily, however, even Harvey’s more enigmatic pieces are laced with a humour I’m tempted to call sad and little (though neither really apply as such) that is sure to crack a smile on anyone paying the low, low attention fee of half-assed. Her humour seems, to me, sad and little (neither in a bad way), because her other emotions and thoughts seem so huge that levity is oven an underscore in an already underlined stanza. This kind of humour sneaks up on a reader and makes them crack an unwitting grin, unconsciously subduing the full realization of that particular art in order to not detract from the whole.